Starting off in boating is easy – the difficult bit is deciding what part of the sport to try. We publish Tips For Those Buying And Selling Boats on our dedicated boats for sale site. This part of the website provides you with invaluable tips and advice from people within the new and second hand boat industry. We provide information about the types of boats that are out there and what to look out for when buying a new or used boat. We also list some of the precautions you might want to consider before buying a boat. There are lots of things to look out for which do not always immediately meet the eye. We aim to give you relevant information regarding the negotiations involved in selling or buying a boat and also provide guidance on how to finance the purchase of your dream boat. Below you'll find extra information and articles about how to get started in Irish boating. If anchoring in a secluded cove or a BBQ from the deck of a yacht sounds like a far-fetched idea this summer, then it might be time to think again. More and more people across Ireland are discovering that the shoreline represents a border but also a means of escape. The romantic freedom of sailing is as true today as it has been throughout maritime history. Harnessing the elements for propulsion is one of the most appealing things about an afternoon afloat. You don’t need a licence, insurance or experience to own and operate a pleasure craft in this country. And what’s more, the wind and the waves are free! The sailing principles used by the Vikings when they sailed up the Liffey are the same as those used today on an afternoon potter around Dublin bay. Over the centuries, man has fine-tuned his ability to use the wind. Indeed, it’s now possible to sail faster than the wind. However, most people going afloat are not focussed on speed – they simply want to watch the world go by. The boats may have changed since the Vikings but the view around the coast – except for the cities – is pretty much the same as a thousand years ago. Nowhere was this point more clearly made than last year when the world’s top offshore sailors called in unexpectedly to our south and west coasts. So far our waters remain remarkably unspoilt and it’s one of the reasons French and German sailors have been enjoying our coastline for decades. But it’s only quite recently that there has been any kind of increase in the Irish pleasure boat numbers with more and more people sticking their toes in the water. The marine industry is also playing its part, attempting to break down the preconception that crusty old yacht clubs rule the seas. Figures from a report commissioned by the Marine Institute in 2005 show that 142,000 adults were involved at that time in boating activity – ranging from sailing and boating at sea to boating on inland waterways. The survey confirmed a large rise in numbers in coastal and inland boating and water sports since the last survey ten years previously. Unfortunately, unless you have a background in sailing, getting started can be anything but easy. Even at this year’s boat show, there will be a bewildering amount of information about many different types of boats. Websites, dealers and magazines all have their merits but often the best place to start is an honest conversation with yourself. Are you buying a boat on a weekend whim or is it something you’ve been planning to do since lodging your first SSIA money? A boat with a cabin, no matter how small, is just one practical way of escaping the worst of a showery day. It’s also a great way to extend the boating season that runs typically from St Patrick’s Day through to the end of September and it’s no accident that the most successful brands in Irish harbours all have some form of cover. Going afloat is not just about racing yachts at Cork Week nor is it just about early morning trolling for trout on the river Shannon. It’s also about coastal kayaking, diving and windsurfing and many other forms of boating to boot. But most of all it’s about experiencing our coastline or inland waterways, something that has its own appeal and is proving as much a form of stress relief as any round of golf or Spanish holiday apartment. Out on the water, sailing can be many different things to different types of people. It can be exciting, invigorating, relaxing or challenging. And you need to decide is what you really want from a boat. There are reasons why people might stay off the water in Ireland. The sun doesn’t always shine and, more to the point, there appears to be a gale somewhere around our coast every fortnight. And then there’s the perceived high cost of entering the sport of boating and, until recently, a complete the lack of public berthing facilities. But if you can deal with all these questions and are still keen to go afloat, any one of a range of schools can advise you on the right way to get started. A good information website is www.sailing.ie and search for a school in your area. Lakes, rivers and seas are a great resource but anyone going afloat in Ireland needs to realise that it can be a potentially dangerous environment and take steps to educate themselves in safety measures before going afloat. For most people, anchoring a boat in the lee of Ireland’s Eye for a picnic or island hopping on a sun-kissed day on Roaringwater Bay are not really unrealistic ideas at all if they are determined to get afloat. If you want to get started, start asking questions now. Very soon, you could be sitting back to hear the ripple of water off the bow. You can leave your slippers on. Anyone can pick up the basics in a week’s tuition and can continue on their own after that. Will I know it all then? They don’t call it the lifelong sport for nothing. Even old salts learn something knew every time they go afloat. No, one of the reason people enjoy sailing so much is that it is regulation free. The wind and waves are free but everything else you pay for. You can rent for a few hundred for a weekend charter. You can buy a sailing dinghy for three grand. A 25-foot yacht can be bought second-hand from 15 grand upwards. What’s the typical size boat here? Between 25 and 35 foot. It is in Dun Laoghaire and it’s an 80-footer costing over E2m. How long is our coast? 8,960 kilometres of coast but about 704 miles sailing distance. It takes two weeks to cruise round but the record is less than three days! How many harbours and piers? The Department of Communications, Marine & Natural Resources say there are 900 so there’s plenty of places to call into. How many marinas are there? Only 26 around the entire coast. There is a real shortage and none between Kerry and Donegal. All of them are full. Where is the biggest marina? 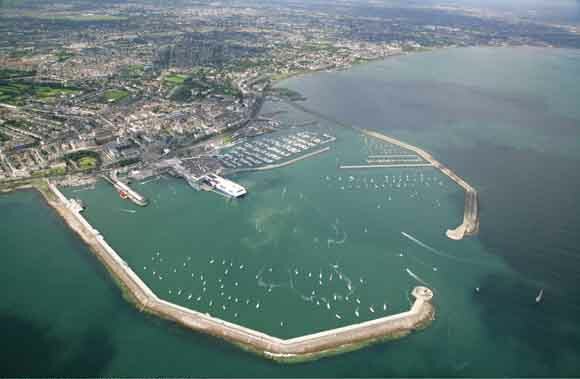 Dun Laoghaire with over 800 berths. There are 700 kilometres of navigable rivers and lakes and freshwater sailing is very popular too. How many sailing boats are there? No one knows. The Irish Marine Federation reckons there are approximately 27,000, based on number of boats registered with Waterways Ireland, marina berths, swinging moorings, sailing and sea angling club boat parks. Last but not least, do I need a cravat? Well, you won’t be alone in Dun Laoghaire. Everywhere else it’s a t-shirt and jeans. Sailing is trying to shed its crusty yachting image and most yacht clubs welcome new members with open arms. Edward Heath famously grumbled about the cost of boating 30 years ago when he complained that “ocean sailing is like standing under a cold shower tearing up five pound notes”. Three decades later, boat dealers are quick to point out that as luxury products go, depreciation on boats is not such a black hole even in this economic climate. Walk along the waterfront of Ireland’s biggest boating centre at Dun Laoghaire on any summer Saturday and repeat Sir Ted’s comparison to the growing band of boat owners and it’s sure to draw a telling smile. Those passionate about boating normally avoid any talk of cost. From Monday to Friday they may be wage slaves but boyhood dreams are relived at weekends, and it has become an unwritten law of the sea that the boat account is never scrutinised. Heath, a great yachtsman, was being unnecessarily harsh. In examining the contents of his wallet, he forgot about the pleasures of boating. It’s there, from the simple smell of sea air to the sense of adventure offshore, but most of all the good times on board with friends and family. If you want to make money, buy a house; if you want to lose money, buy a car; but if you want to keep your money, buy a boat. At least, that’s the story your local boat dealer is likely to advance. Thanks to the lower cost of mass-produced boats and equipment in recent times, there has never been a better time to get involved. As leisure pursuits go, sailing in Ireland represents surprisingly good value for money – if only the facilities were there to back it up. Take a look over the breakwater at Dun Laoghaire’s public marina and it’s pretty clear that both the size and style of pleasure craft berthed there – particularly motorboats – is impressive. If you wanted a snapshot of the former Celtic tiger era, here it is. Since the marina opened 400 berths in 2001, it has grown to become an 820-berth facility, has transformed boating in Ireland and led to an influx of new blood where access to the water was previously controlled by private yacht clubs. In doubling Dun Laoghaire’s size over the past six years, the facility that took sceptics 20 years to build became an overnight success. It is the country’s largest marine leisure centre by a long chalk. It is also the shining jewel in an otherwise flawed necklace of marinas still to be built around the coast. Providing facilities takes considerable investment – from the State or from private investors, or a combination of both in public-private partnerships – because marinas need expensive breakwaters or sea walls to protect pleasure craft from the open seas. But even with such obvious infrastructural deficits, there is a surge of interest in the freedom of the seas and a lot of it is being driven by novice boaters. You don’t need a licence to own and operate a boat in this country. And what’s more, in these recessionary times, the wind and the waves are free. But for everything else you will need a cheque book. Growing numbers of the Irish public are demonstrating, in many cases for the first time, that boat ownership is no longer beyond their financial reach, particularly over the past ten years, a period in which the flow of newcomers has been tracked by official figures. At a cost of E425 per metre as one of the top rates for mooring fees, it’s pretty easy to work out how much it costs to park an average 40-footer (12-metre) in Dun Laoghaire or at one of 22 other coastal facilities around the country. But boat ownership costs don’t stop with an annual berthage fee. A typical new 40 footer will cost an owner (with modest cruising plans of 100 hours) E13k–E14k per annum. This includes berthing, fuelling, servicing and insurance. Even if a boat owner has signed his cheque for all this, that isn’t the end of the story. The romantic freedom of boating is as true today as it has been throughout maritime history. The seas might be free to roam but finding a berth is not quite as easy. In fact, demand was so high until the credit crunch that a lack of berths was hampering further growth of the marine leisure sector. Downturn aside, the industry is capable of growing by around 30% over the next three years – if the government and local authorities decide to unlock the potential that lies in Irish waters. The west coast of Ireland is hardest hit with no marina facilities between Kilrush Creek, Co Clare and Fahan, Co Donegal. Thankfully a small facility in Galway now has the green light compliments of the Volvo Ocean Race. “On the east coast significant gaps exist between Arklow and Kilmore Quay and on the south coast between Kilmore Quay and Cork Harbour”, says Steve Conlon of the Irish Marina Operators Association. Users are calling for government action to cut the bureaucratic red tape that surrounds foreshore development for marine leisure usage. 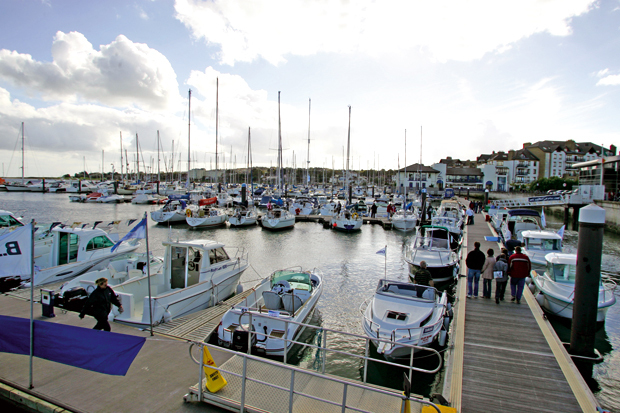 The trade body fears that the run of new boat sales could be short-lived as a shortage of berths around the coast hampers the growth of the sailing industry. In the major sailing centres on Dublin Bay and Cork Harbour – representing 3,000 craft – all five marinas are full or nearing capacity. The Irish Marine Federation estimates the number of berths needed to bring Ireland up to the EU average is 22,826 berths. To accommodate existing waiting lists and boats located on existing swinging moorings, an extra 2,000+ berths are required immediately. Motorboats remain the big growth area and the evidence at the national boat show in 2007 bore this out when ‘bling bling’ replaced the sea shanty as the new wave in boating. Eighty-five per cent of the exhibits were powerboats – from jetskis to James Bond super yachts – and a sign that there has been a shift in the market away from its traditional musty yachting base. This is no real surprise to the marine industry, however. The wind of change has been blowing through the world’s boat shows for the past decade. Put simply, power boating is perceived to be much more accessible than sailing for the newcomer. “Power boating has a ‘jump in and go’ image whereas sailing – whether it is true or not – appears more complicated,” says Irish Marine Federation’s Brian O’Sullivan whose own company, O’Sullivans Marine of Tralee, sells both types of craft. O’Sullivan’s comment is backed by Irish Sailing Association (ISA) training statistics. Figures point to a 33% rise in power boat instruction, as opposed to only a 6% rise in sail training – and these figures are merely the tip of the iceberg because they represent only those who opted for the voluntary certification scheme. In spite of our miles of coast (and a further 500 miles of navigable rivers and lakes), Ireland has one of the lowest ratios of boat ownership in Europe: one boat to 158 people. The European average is one boat to 42 people. Industry figures argue that low participation in watersports is not because Irish people don’t like boats; it’s because a lack of facilities prevents both residents and tourists from getting access to the water and enjoying a coastline that is arguably our greatest natural asset. There are only three public slipways between Dublin city centre and Bray in County Wicklow – serving a population of 750,000 or more. The situation in the rest of the country is not much better, with a Department of the Marine estimate of 900 piers and harbours around the coast. Growing participation and competition among boat builders means there has never been a better time to get involved. In spite of Ted Heath’s grumblings over fivers, a boat is not just a black hole into which you pour your hard-earned cash. But if you do splash out on a boat this summer, just remember you also need somewhere to berth it.